Villa Frassineta is a manor house built in the late 1800s and has always belonged to our family. With the recent restoration we have equipped the structure with all modern comforts, while maintaining the original architecture and materials and preserving the vintage furnishings that belonged to the family. The villa is an Art Nouveau building and is spread over three levels: on the ground floor are the dining room, the satellite TV living area and fireplace, the modern fully equipped kitchen, a bathroom and laundry area; on the first floor there is a small living room, the old kitchen with the large stone fireplace, 3 bedrooms with frescoed ceilings and 2 bathrooms; on the second floor there is a small living room, 4 bedrooms and 3 bathrooms. 7 rooms available, 5 are doubles and 2 with single beds, for a total of 14 beds. It 's also a sofa bed for an extra guest. All rooms have air conditioning and the bathrooms, all of new construction, have a shower. The villa is surrounded by a beautiful garden with fruit trees, vegetable garden and aromatic plants. The kitchen leads directly to a paved area where there is a barbecue and a pergola with a large table. Next to the pavement there are the old well, the stone wash-house and the old lemon-house, now used as a dressing-room for the pool. The swimming pool, open from May to September, is for the exclusive use of guests. The property, completely fenced and covered by free wi-fi, occupies an area of ​​about 3000 square meters. With the exception of low season and new year periods, we only accept bookings with arrival and departure on Saturdays. We are two sisters and a brother, Maria, Lucilla and Michele. Even if anyone has his own job, we’ve decided to keep and renew our father's farm and to begin together with Daniela the new experience of offering hospitality in our country villa. Villa Frassineta is the house where we used to spend the summer holidays in our childhood in a peaceful and thoughtless atmosphere together with our parents, uncle and aunt. Our childhood memories, our deep affection towards the family house and the consciousness of the importance of living moments in touch with nature have inspired us to restore the villa and the garden and to share this wealth with our guests. 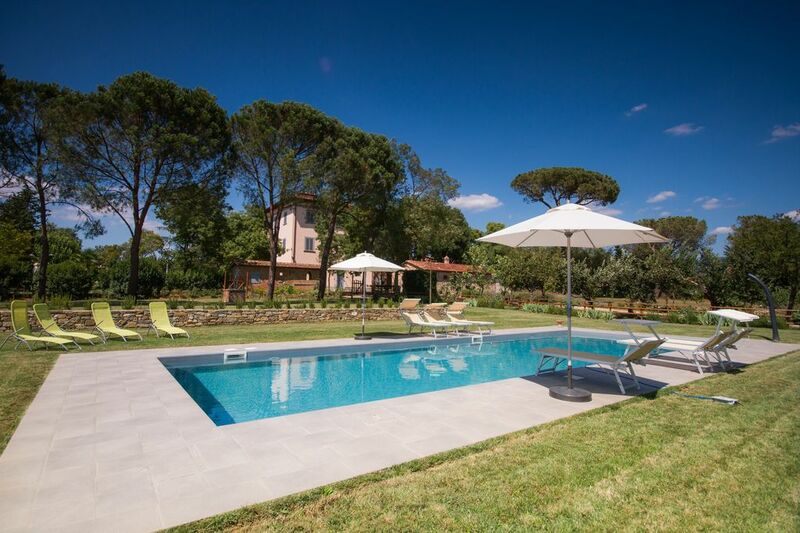 We have just returned from an idyllic fortnight's stay in Villa Frassineta. The villa has been renovated superbly while retaining its original character. The decoration and furnishings are perfectly in keeping with the age of the property and yet it has all the modern conveniences you could wish for......wifi, Netflix, air con, etc etc. The linens were crisp and white, the towels soft and fluffy! And there was ample china and cutlery so that we never ran out. The gardens and pool are both large and well maintained by Lucciano who was there twice everyday but never intrusive. Our only regrets are that we didn't discover all the lovely outside lighting till the last night! Our fault...Daniela had told us where the switch was! Finally Daniela was so helpful throughout the whole time, from when we booked till we left. She recommended Antica Pieve and Menchettis for meals out both of which we visited twice. And we used the services of the chef on two evenings which worked really well for us. We have been staying in villas across Europe for the last 20 years and Villa Frassineta is undoubtedly one of the best! Villa Frassineta is beautiful inside and out from the decorations to the lovely flower and vegetable garden to the pool. The house and grounds are much nicer than in the photos. It is the perfect house for a large family to spend time together in Tuscany. The kitchen is well equipped. There is a smart TV with Netflix. The house is a hour (or less) drive to many places of interest. We would highly recommend it for your next vacation! There is A/C on the second floor that works for those bedrooms. During the summer, The bedrooms on the third floor and 1st floor rooms. It was difficult for guests on the 3rd floor to sleep. If you open the windows, mosquitoes come in so asking for fans would fix this problem. We had a wonderful vacation at the villa. It was the perfect location for day trips to the towns around it, and then the perfect retreat in the afternoon for a swim and a homemade meal. The house has a lovely garden, with flowers, vegetables, and fruits, which is perfect if you want to cook at the villa. We also hired the chef to cook for us, and it was spectacular! We had plenty of left over for another meal and the price was unbeatable. If you are looking for a place to relax, and enjoy Tuscany, this is the place for you! Danielle and her family were easily available at all times. We highly recommend it! Thank you very much, Agda, and thank you for being such kind and friendly guests! Wow, our stay at Villa Frasineto was completely wonderful! From initial communication to checkout, the entire process was flawless. Daniela and Lucilla were wonderful to deal with and made our stay perfect. The villa was impeccably clean, the pool sparkling, the grounds absolutely enchanting and the kitchen was modern and well appointed. The villa is close to Arezzo and Cortona which are really lovely small towns. We were close to shopping, yet far enough away for a quite stay in the Tuscan countryside. We really enjoyed cooking great meals and eating on the patio right outside the kitchen. The provided bikes were also great for a laid back ride through the neighboring farms and countryside. The main house is really beautiful and all the rooms were just perfect. Lucilla was so helpful with tips about the neighboring area and made us feel very welcome. I highly recommend a stay here. We really had the perfect family vacation and can't wait to get back. Thank you Wade for such nice words! We try to do our best to welcome our guests and it's a pleasure for us that you and your family had a good time! We had a great time in that house. It is just fantastic. Real florentine style, charming, enough space for everyone (13 people) and all necessary comfort. Beautiful garden and fantastic pool. Perfect stay for 13 people! The location is also exceptional. We will come back! thanks for your nice review, we're really glad that you had a nice and comfortable stay. It would be a pleasure for us to host you again! Villa Frassineta is located in the open countryside and is therefore an ideal place to spend a holiday of relaxation, comfort and privacy. At the same time, its strategic position in the heart of Tuscany makes it an excellent base for visiting not only the nearby Arezzo and Cortona (just 20 minutes), but also the cities of Florence, Siena and Perugia, all reachable in a driving time. From the villa you can easily reach the Val d'Orcia, Lake Trasimeno and many beautiful historic villages of Tuscany and nearby Umbria. For shopping lovers the Valdichiana Outlet Village is only 20 minutes away. The Rapolano Terme thermal baths are a 30-minute drive away. Pizzerias, restaurants and supermarkets can be reached in 10 minutes. Il costo delle pulizie finali è di 200€ da pagare alla partenza (obbligatorie). Tassa di soggiorno (obbligatoria) da pagare in contanti alla partenza, calcolata sul prezzo d'affitto a persona a notte secondo le seguenti fasce di prezzo: prezzo p.pers./notte fino a 20€ , tassa di 1€ prezzo p.pers./notte tra 21-200€, tassa di 1,50€ prezzo p.pers./notte sopra 200€, tassa di 3€ La tassa si paga per le prime 4 notti; sono esenti i minori fino al compimento del 12° anno di età. Ad eccezione dei periodi di bassa stagione e Capodanno, si accettano solo prenotazioni con arrivo e partenza il sabato. Opzionali: L'aria condizionata è disponibile su richiesta al costo di 10€ al giorno. Il riscaldamento invernale verrà addebitato a consumo al prezzo di 5€/m3 di gas. Governante su richiesta a 16€/ora. The cost for the final cleaning is 200€ (obligatory) and is to be paid before departure. Tourist tax (obligatory) to be paid before departure. It is calculated according to the rental price per person/per night: for rental price p.pers./p.night up to 20€, the tax is 1€ for rental price between 21 and 200€, the tax is 1,50 for rental price over 200€, the tax is 3€. The tax is required for the first 4 nights; children up to 12 years old don't pay. Except from low season and New Year's Eve/New Year's Day, we accept reservations with arrival and departure on Saturdays only. Optional: Air conditioning is available on request at the cost of 10€ per day. Heating is charged according to consumption at the cost of 5€/m3 of gas (gpl). Cleaning lady available on request at 16€ per hour.